There were lots of smiles as Cerenity Roberts, left, and her mom, Desiree Roberts, right, and Leslie Friesenhahn finish their shopping at the Assistance League’s Operation School Bell, in San Leon for Dickinson ISD students. Some 1,725 students from financially challenged families in the Clear Creek and Dickinson school districts headed off the class this fall with new clothes, thanks to the Assistance League of the Bay Area’s Operation School Bell program. Working with officials from area schools, every year the Assistance League identifies children whose families are experiencing financial hardship and invites them to “shop” for new school clothes, during Operation School Bell. Each summer, Assistance League volunteers transition their Resale Shop, located at 100 E. NASA Parkway, Suite 80, in Webster, into the headquarters of Operation School Bell. Retail racks are moved aside to make way, as shelves are stocked with new clothes, gallon-sized Ziploc bags are filled with shampoo, toothpaste, deodorant, and toothbrushes, dressing rooms are set up, and volunteers are scheduled to prepare for the throngs of families that will be invited to come as soon as school starts. 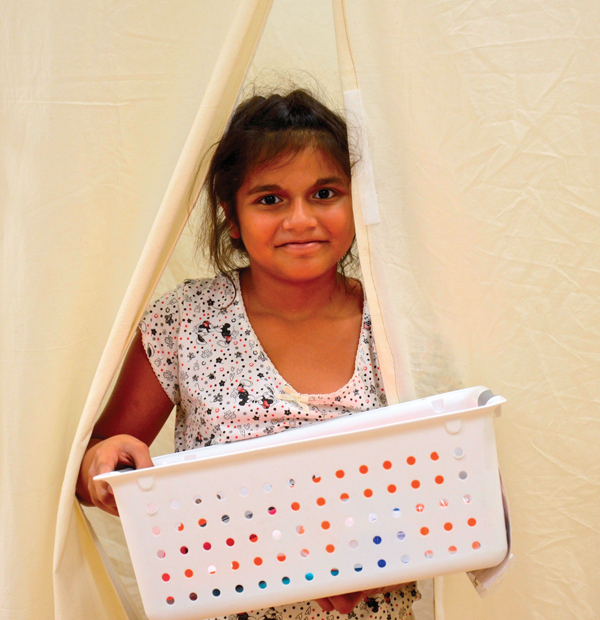 For two weeks, families come to the shop to receive clothing assistance. Students from grades k-5 come to be fitted with a wardrobe of new clothes, receive their own bag of hygiene items, and also a voucher for PayLess shoes purchased by the organization. League volunteers work with each child and parent, making sure the clothes fit. Alize Gonzalez merges from the dressing room in San Leon as Assistance League members dressed some 400 children from Dickinson ISD. Secondary students (grades 6-12) receive a voucher to shop at Target, and once they arrive at the store, receive shopping help from Assistance League of the Bay Area volunteers as well as Target team members. 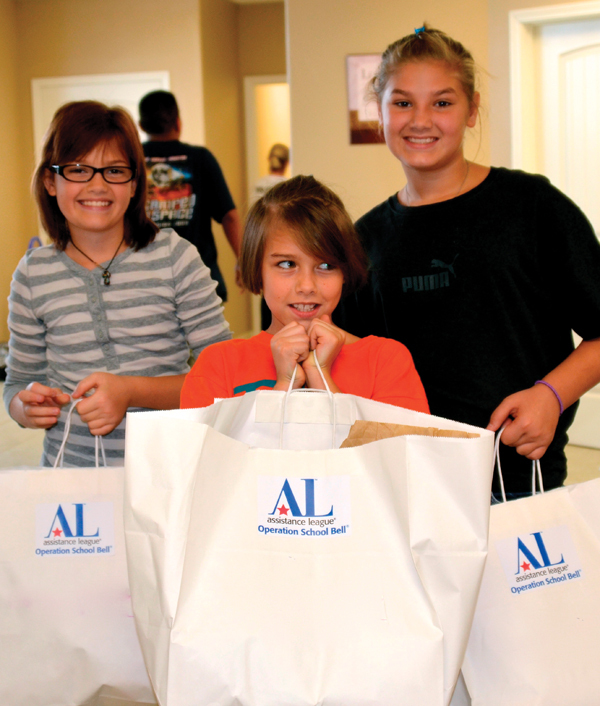 For the second year in a row, the Assistance League was able to clothe 400 children from Dickinson ISD by joining forces with Lighthouse Christian Ministries of Bacliff. While the Assistance League provided clothing, shoe vouchers, and hygiene items, LCM distributed backpacks and school supplies to the students on the same day. Setting up the distribution at Bayshore Christian Fellowship in San Leon, volunteers from Assistance League of the Bay Area, LCM, Target, and staff from Dickinson ISD worked the entire day – while the sky poured rain – cheerfully meeting the needs of families struggling to make ends meet. 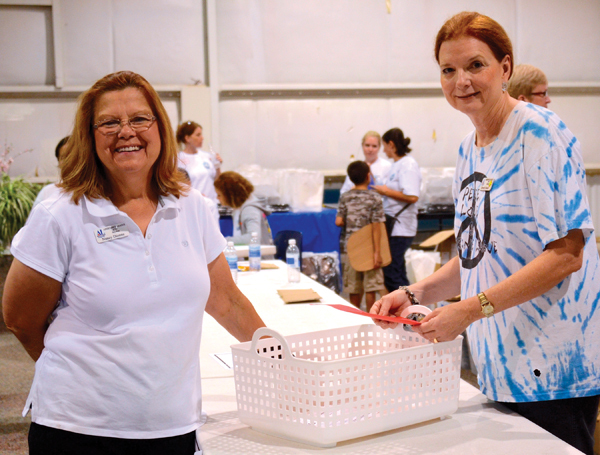 Nancy Dionne, left, and Beverly Braden prepare baskets for the Assistance League’s Operation School Bell, which clothed 1,725 students this year. Erika Steele, director of Lighthouse Christian Ministries, said the backpacks and school supplies were donated by Target, Clear Creek Community Church, CityMark, Gloria Dei Lutheran Church, Clear Creek Republican Women, Bay Area First Baptist Church, and Living Word Church of the Bay Area. Kroger provided water for the volunteers, and Chick-fil-A provided lunch. 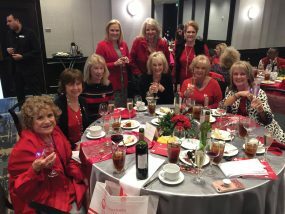 Guided by Operation School Bell Chairmen Elizabeth Arceneaux, Cindy Senger Lewis, Kathleen Courville, Sarah Foulds, and Suzanne McMannis, nearly 200 volunteers were needed to make this program a success. In all, 70 Assistance League members, 24 Assisteens and 90 members of the community, including Target team members, Dickinson ISD personnel, LCM volunteers, and members of Clear Creek Community Church, volunteered during Operation School Bell this year.